Your new album is entitled 'Different' can you explain the meaning behind this? Well to name a few: with Phil a different singer on board, our long time keyboardist Rolf no longer being a full member, leaving me with additional keyboard duties, more focus on the rock side of things and on melody and riffs, and less on the progressive side, more guitars. All in all enough reason for us to go with the title Different. Also, this gave us a way to keep our releases in line with the alphabet after previous albums A Dragon's Birth, Breathe Fire and Challenges. Would you say it's a huge difference in both music-style and quality from your previous effort? Yes, I do like to think this differs. This album is more about rock, melody and vocal harmonies than it is about the more technical stuff that isassociated with prog. Although we still could not resist a couple breaks and stuff like that. And of course our progressive roots have not disappeared completely. Quality is in the eye of the beholder. I still love the Challenges album, but it is just a complete different animal. Also the production on this is way different. 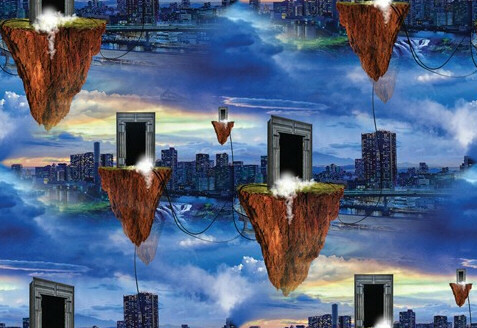 Challenges is a dry and uncompressed album, so needs more time to sink in. It is also a far more heavy progressive album. Different is a big sounding production with lots of power. At least in my humble opinion. My thanks go out to Erwin Hermsen from Toneshed Studio for an excellent job.I found that working 9 years on an album really started to cloud my judgement, so I was happy he could step in. Kindly tell us something about the writing process and what you're trying to capture. Phew, that is a tough one. Most of the time I will start with a musical idea which I will then demo in my studio. After writing the lyrics to them (or adapting one of the many ideas I have laying around) I will start on expanding the arrangement, depending on the band and album it is intended for. For Different the intention was to create a more focussed album, with emphasis on melodies and guitars. And judging from the response so far, Ithink we delivered that. Yes I am very proud of the album, but then again, I would never release an album I do not believe in. ( I also run the Rock Company label). For me it is not really a new Chinawhite. With 9 years passing after the previous album, for me it is more of a natural development. 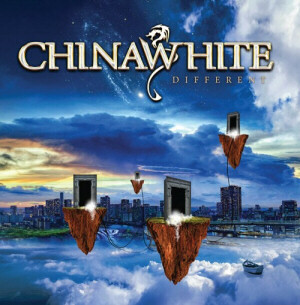 And since in the meantime I got involved in more bands and projects, it makes it easier for me to say that when I write a rock song, it is for Chinawhite, and a prog song goes to Forest Field, etc. Although I tend to write album based ever since I decided to expand my activities. "Where I Stand", what's it all about? I'm really fond of its opening verse. Happy to hear you like it, thanks! I am not really keen on explaining lyrics, I prefer everyone to give it their own meaning. Although I think that the verse you are referring to is pretty much self explaining. If you turn on the TV or follow the news, you might start to think we have all become actors in some bizarre play. Or maybe it is what Denzel Washington has said; "if you do not follow the news you are uninformed, but if you follow the news, you are misinformed". That bit of a dystopian feel is reflected quite accurately in the artwork from the amazing Blekkmark Designstudio. Tell us something about "Wings of the Wind". Wings Of The Wind was also present on our previous album Challenges. So it might be one of the more prog heavy songs on Different. But to be honest I wasn't totally happy with the final result on that CD. Our singer at the time had a lot of personal issues and this was the last song he finished before we split. I felt the song deserved better. So back to the original idea for the lyric and the vocal melodies. Phil did an amazing job with those, and as usual he kills on the harmonies. How did you hook up with vocalist Phil Vincent, and what did he bring to the table? Phil and I go back 8 to 10 years now and even when we have never met in person, I think of him as one of my best friends. We have a great understanding of each other's music, so work really well together. I am proud that he has asked me to play some solos on several of his releases. And even more proud he likes to sing my songs as he has done on several Forest Field releases and now this Different album from Chinawhite. Since Phil is obviously no stranger to melodic hard rock, he has delivered some great lead vocals as well as some amazing chorus harmonies and counter melodies. He needs little guidance to come up with that stuff and always manages to surpass my expectations. And of course contributes to the lyrics in case I write a sentence or word that does not quite work as he wants ha ha. What kind of equipment are you using in the studio? Are you in up-to-date or old school? When I started my studio I decided I wanted to go with the industry standard. In my opinion that is Pro Tools and a Mac. I still have lots to learn, but can manage and get better with every release. I am not one to cut up every single bit of playing. As a musician I prefer to play it with the right attitude and emotion. So even a small flaw can have its place, nothing wrong with that when the drive is good. In that sense you might say I am old school. But of course recording digitally has its benefits. And in this case, it was also easy to transfer all to Toneshed to work with. Which I think proved my point. What's the secret behind a good production? Oh, that is a matter of taste I think. If you think back of the first 4 albums from Extreme, the production on the 4th album was very dry when compared to for instance Pornograffitti. I loved it, but some critics hated it. Some goes for Challenges, some hated the sound, in other occasions it became the album of the month / week. For me as an artist I try not to think in terms of good or bad, I will always try to deliver the best I can within the vision I have about the album. And when you keep an open mind, and always try to learn, things will change, and for me, that is how it is supposed to be. With Different, Erwin from Toneshed initially considered a more keyboard heavy sound, but when I explained my intentions with the album, he went for what you are hearing now. Believe it or not, but he only did 2 rounds of mixing. After his first attempt our bassist Sander and I wrote down the comments we had, he changed that, and we were finished. For me, that is a great way of getting a good production. Working with people that understand you, and have the ability to deliver in line with your vision, isjust great! What kind of 'sound', production wise, did you have in the back of your mind prior to recording? When I started recording, I had no idea of who would sing on the album. So like I do with all recording, I just set out to get all the instruments recorded as good as I could. And after years of trying to find that voice, and finally getting Phil on board, it became obvious where we would be heading. For me, from the songs, the playing, the sound, to the art, it all belongs together! Thanks Urban for getting in touch, hope I managed to get my point across and answer your questions to your satisfaction. And if not, you know where to find me.... I am of course very curious on how you and your readers respond to the album. I also hope that people who like the music, support the band by buying it on CD or on legal download sites. For independents like us, that is vital and the only way to help us continue to create! There is a webshop from the label at www.rockcompany.nl, but you should be able to find it in all good stores. And last but not least, I want to thank my mates Phil, Sander, Hans and Rolf for their playing, Blekkmark for the art and Erwin for mixing and mastering. Cheers. Photos... very hard to find! (c) 2018 RockUnited.Com - Contact or simply send your answers to above address.